Instant downloads of all 946 LitChart PDFs (including Hunters in the Snow). Welcome to the LitCharts study guide on Tobias Wolff's Hunters in the Snow. Created by the original team behind SparkNotes, LitCharts are the world's best literature guides. A concise biography of Tobias Wolff plus historical and literary context for Hunters in the Snow. A quick-reference summary: Hunters in the Snow on a single page. In-depth summary and analysis of every of Hunters in the Snow. Visual theme-tracking, too. Explanations, analysis, and visualizations of Hunters in the Snow's themes. 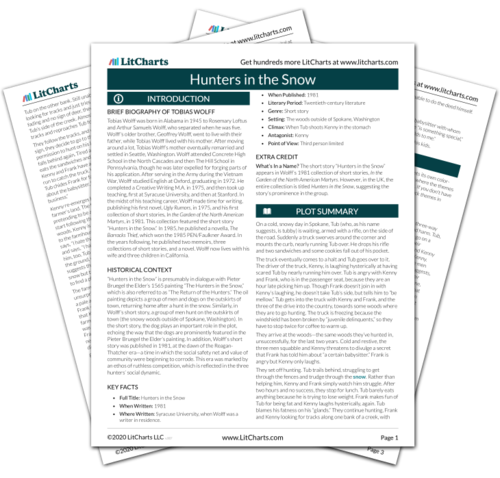 Hunters in the Snow's important quotes, sortable by theme, character, or . Description, analysis, and timelines for Hunters in the Snow's characters. Explanations of Hunters in the Snow's symbols, and tracking of where they appear. An interactive data visualization of Hunters in the Snow's plot and themes. Tobias Wolff was born in Alabama in 1945 to Rosemary Loftus and Arthur Samuels Wolff, who separated when he was five. Wolff’s older brother, Geoffrey Wolff, went to live with their father, while Tobias Wolff lived with his mother. After moving around a lot, Tobias Wolff’s mother eventually remarried and settled in Seattle, Washington. Wolff attended Concrete High School in the North Cascades and then The Hill School in Pennsylvania, though he was later expelled for forging parts of his application. After serving in the Army during the Vietnam War, Wolff studied English at Oxford, graduating in 1972. He completed a Creative Writing M.A. in 1975, and then took up teaching, first at Syracuse University, and then at Stanford. In the midst of his teaching career, Wolff made time for writing, publishing his first novel, Ugly Rumors, in 1975, and his first collection of short stories, In the Garden of the North American Martyrs, in 1981. This collection featured the short story “Hunters in the Snow.” In 1985, he published a novella, The Barracks Thief, which won the 1985 PEN/Faulkner Award. In the years following, he published two memoirs, three collections of short stories, and a novel. Wolff now lives with his wife and three children in California. 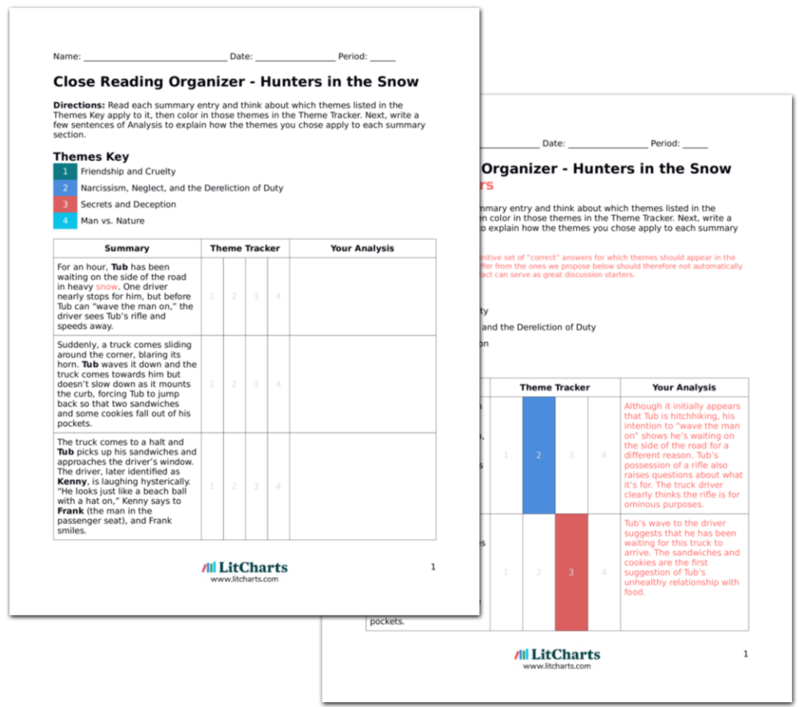 Get the entire Hunters in the Snow LitChart as a printable PDF. “Hunters in the Snow” is presumably in dialogue with Pieter Bruegel the Elder’s 1565 painting “The Hunters in the Snow,” which is also referred to as “The Return of the Hunters.” The oil painting depicts a group of men and dogs on the outskirts of town, returning home after a hunt in the snow. Similarly, in Wolff’s short story, a group of men hunt on the outskirts of town (the snowy woods outside of Spokane, Washington). In the short story, the dog plays an important role in the plot, echoing the way that the dogs are prominently featured in the Pieter Bruegel the Elder’s painting. In addition, Wolff’s short story was published in 1981, at the dawn of the Reagan-Thatcher era—a time in which the social safety net and value of community were beginning to corrode. This era was marked by an ethos of ruthless competition, which is reflected in the three hunters’ social dynamic. Where Written: Syracuse University, when Wolff was a writer in residence. What’s In a Name? The short story “Hunters in the Snow” appears in Wolff’s 1981 collection of short stories, In the Garden of the North American Martyrs. However, in the UK, the entire collection is titled Hunters in the Snow, suggesting the story’s prominence in the group. Weeks, Rachel. "Hunters in the Snow." LitCharts. LitCharts LLC, 7 Jun 2018. Web. 23 Apr 2019. Weeks, Rachel. "Hunters in the Snow." LitCharts LLC, June 7, 2018. Retrieved April 23, 2019. https://www.litcharts.com/lit/hunters-in-the-snow.